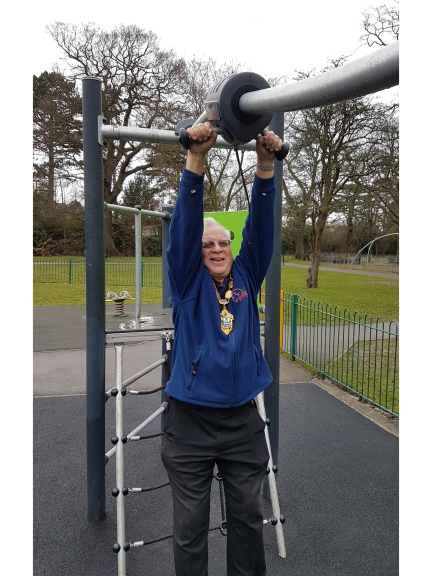 The Mayor of Epsom & Ewell, Councillor Neil Dallen, has joined the Friends of Court Recreation Ground to check out equipment newly installed in the children’s playground. The new play equipment, a track ride and a wheelchair accessible roundabout, were made possible from the neighbourhood portion of funds from the Community Infrastructure Levy. 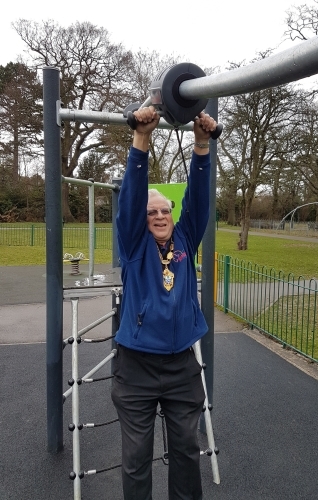 The Mayor was keen to try out the equipment and having commented positively, both on the items themselves and also on the playground rubber safety flooring under the track ride, he declared “outside play at a young age is the first steps to exercise and social interaction and I’m pleased to see the council investing in the youth of the borough in this way”. 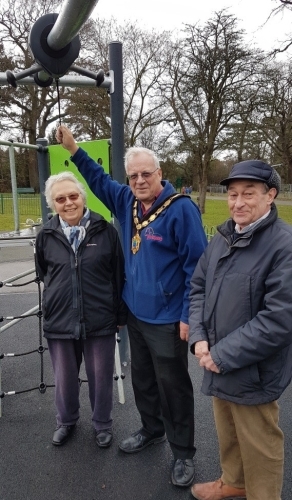 Janet Wolfinden from the Friends of Court Recreation Ground said “We love this park and the continuing investment that it receives are crucial for this green space in the heart of Epsom”. Michael Ball continued “the Friends have an ongoing dialogue with the Council and with individual councillors to raise issues for the improvement of Court Rec for its users”. Most of the parks in Epsom and Ewell have a Friends group, with some more active than others. A Friends group is made up of local residents and other interested parties who dedicate their time and knowledge to improve their local park or open space. Anyone can join a friends group, you don't need to live in the immediate area to be a member and it is up to you how much time you dedicate. The Community Infrastructure Levy allows the Council to raise funds from developers undertaking new building projects in the borough and is used to support new physical and social infrastructure and also to improve existing facilities. Under legislation, 80% of total CIL collected has to be allocated towards borough wide infrastructure. In addition, 15% of levy receipts must be spent on community priorities, this is referred to as the ‘neighbourhood portion’ of the levy.